Shank Castle has been described as a certain Tower House, and also as a probable Bastle. This was large and late for a pele tower and is better described as a tower house, in the sense of being an integral building rather than a solar block attached to a hall, although it was a gentry status rather than baronial building. 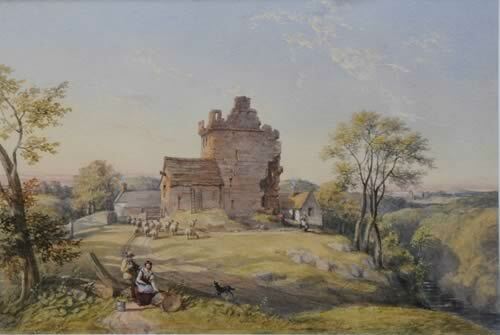 A C19 watercolour shows a Scottish style tower house of 4-5 storeys. Said to be marked 'waikelli' on 1590 map, without a symbol, but this seems to a mistranscribing of Lord Burghley's difficult handwriting of bracke'hill i.e. Brackenhill Tower Is marked as a tower 'Shanke' on 1607 map. Was demolished by the owner despite the offer of financial assistance for repair in 1952. Had it been repaired its conversion it suitable modern accommodation would have been relatively easy and it would have, undoubtable, been a sought after property. Historic England (PastScape) Defra or Monument number(s) 11679. County Historic Environment Record (or Sites and Monuments Record) number(s) 39.